We are very excited to introduce our new webinar content and the way the webinar will be delivered to you! Driving school owners have asked for a review (test) to be sure their instructors are fully engaged in the learning. We have integrated six incremental reviews into the course of the webinar. We have incorporated a 25 question review at the end, that when passed, a “Behind the Wheel With ADHD” training hours certification goes directly to the learners inbox. 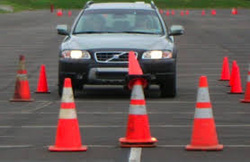 We have added new topics and information regarding aggressive driving, sleep deprived driving and new technologies to assist you, the professional driving instructor meet the challenges associated with attention disorders and novice teen driving. We offer a parent training webinar to support our recommendations and give tools to families to support your training with the teen. Make us aware of any parent who buys the modules through you and we will share the profit with you. The statistics ( accidents, injuries, citations) of novice teen drivers with ADHD continues to be staggering. Education, awareness and mitigation are the keys to saving lives! Please follow this link, take the webinar and inform the parents of the teens you serve. Co-Author of "Behind the Wheel with ADHD"
Disability, Vision, Aging: Effect on Driving Learn how disabilities, vision and aging problems affect driving. Study acquired, congenital, developmental and progressive disabilities. Examine age-related visual impairments. Learn about the driver assessment process, adaptive driving equipment and vehicle modification needs, and driver licensing issues. CEUs awarded. $660 includes $496 fee. Note: Offered in partnership with the Association for Driver Rehabilitation Specialists (ADED). ADED members may be eligible for a reduced course fee. Call 410-777-2939 for more information. Approved for 16 ADED contact hours. Approved by the Maryland State Board of Occupational Therapy Practice for 15 contact hours.